← Live from New York…. It’s Chartchums! Hello Friends! If you are anything like Kristi, you are in the middle of labels, emergency cards, photographs of your new wonderful class, and you haven’t cooked dinner in a week. This is one of the best and busiest times of the year! It is the time when you meet your class and discover their unique personalities, begin teaching, and revel in the small successes. This is also the time when you realize that your writing center is too close to table 1, the routine you were going to use for getting clipboards needs to be revised, and the sand table is just going to make things sandy and there is not much you can do about it. In short, this is the time when what was mine becomes ours and you realize the classroom you set up so carefully was built with no input from the little people that now inhabit it. A quick story. When Kristi’s husband (Geoff) first moved in to the apartment she had lived in for years, she marched him into the least used room and said, “You can put your stuff here.” When Kristi expressed concern that she never saw Geoff because he was always in that same room, Geoff said, “This isn’t our apartment, this is your apartment and I have a room. Nothing feels like mine outside of this space.” So slowly, Kristi relinquished her control and her artfully displayed books were scooted over to make room for Geoff’s vinyl records, and the pictures on the wall were replaced with pictures of the two of them, until the line was blurred and the apartment became a place where a family lives. We tell this story because teachers are masters of control, you have to be to move 25 little bodies out safely during a fire drill, but in order for children to truly feel safe, at home, and have agency, the space you share must truly be shared. Shanna Frazin, a colleague of ours at the Teachers College Reading and Writing Project, once drove this point home by inviting teachers to measure the square footage of their classrooms and divide that number by the number of students plus one (the teacher). The resulting square footage was a teacher’s equal share of the classroom. Yes we need space, but our students need it more! This creation of a classroom family extends to the charts that you make during this critical time of year. Your routines my not be the same as last year, because this class is not the same as last year. Your charts will change because your children have changed. 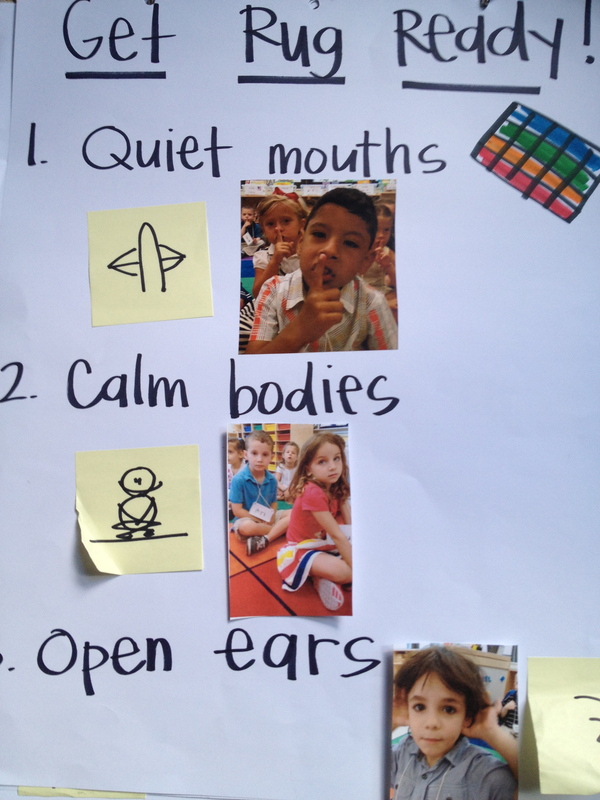 Katie Lee, one the gentlest, smartest, calmest kindergarten teachers you will ever meet created this chart for her students. The beauty is Katie didn’t save this chart from last year and show it this year, she created it with her students just a day or two ago. The bin they put their folder in really is red, and the bin for lunch really is green. That really is the table the children sit at in the morning. Katie has a beautiful chart with its simplicity and its visuals, but more importantly, she created it with her students, and with her students in mind. 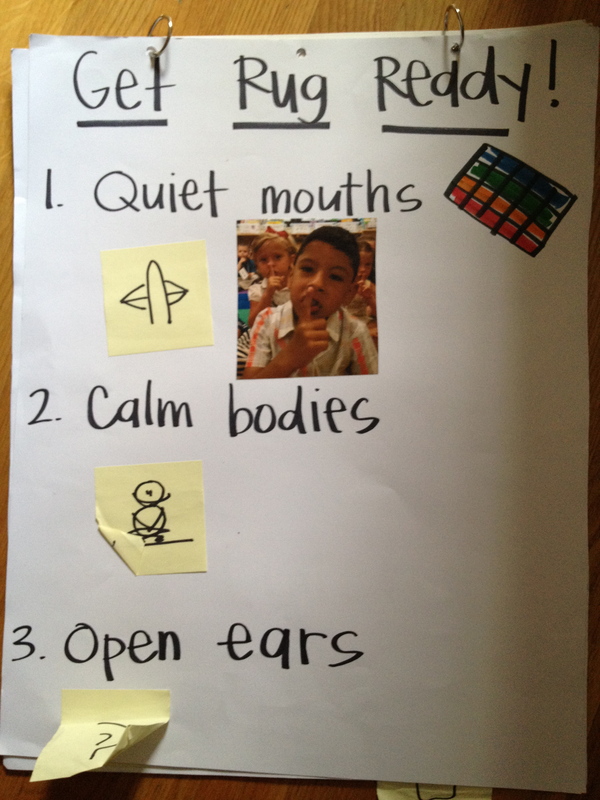 When Kristi wanted to teach the signs and symbols to calm children on the rug, she first used post-its as visuals for the steps. Then as children practiced the routine over a few days, she began snapping pictures so her drawings became replaced by photos of students in the classroom. Additionally, the writing charts that initially showcased her created examples, now have authentic student examples for children to look back to for support. 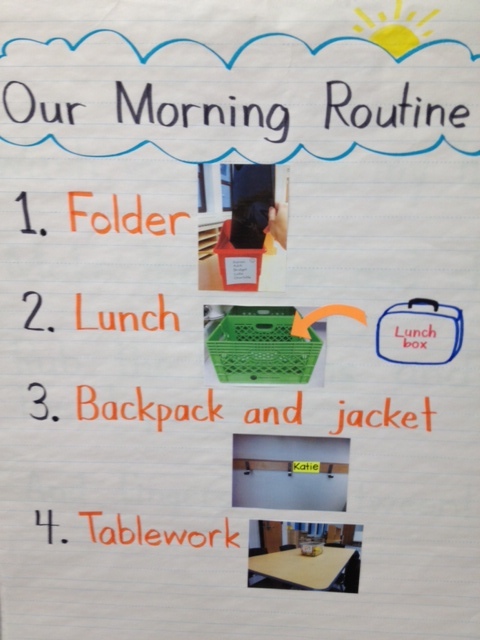 Just like Katie Lee’s chart, these charts reflect all the members of classroom, not just the teacher. Kristi’s class is train crazy. When the “book fairy” brought a train book, the class just about died with happiness. When the lines in the hall were more like knots in the hall, Kristi named the two lines after New York City subway lines (the E train and 6 train) and reworked a line chant to reflect the theme. This chant was written on a chart and serves double duty as a routine chart and a beloved shared reading. Kat Cazes (one more smart, dedicated, and insightful teacher at 59) suggested that children bring home these charts to read as shared reading and reinforce routines. Parents have expressed delight at not only knowing the routines their children are learning, but seeing pictures of their children doing them! 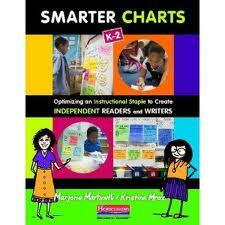 Kat snaps a photo of the chart and prints it out to go in the shared reading folders and/or notebooks. Lucy Calkins emphasizes this indisputable fact: the better you know your children, the better you can teach your children. When you use what you know and what you see to guide your teaching and form your charts you create a community. There are so few photos in this blog post because all of Kristi’s charts have photos of children and examples of children work (parent permission is needed and forthcoming, so soon you will see all these beautiful faces).